I keep seeing this around the blogging world so I thought I would go and take a look. It seems that everyone who book blogs gets to have a bit of a shindig on a Friday, and get to visit each other and say hello. Now I know there are loads of new blogs out there that I have never got to read, so I thought I would join in. I will let Jennifer of Crazy for Books explain the whole set up for you. In the spirit of the Friday Follow, I thought it would be cool to do a Book Blogger Hop to give us all bookies a chance to connect and find new blogs that we may be missing out on! So, I created this weekly BOOK PARTY where book bloggers and readers can connect to find new blogs to read, make new friends, support each other, and generally just share our love of books! It will also give blog readers a chance to find other book blogs that they may not know existed! 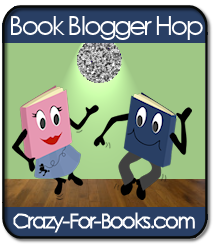 So, grab the logo, post about the Hop on your blog, and start PARTYING! !Your blog should have content related to books, including, but not limited to book reviews. If you fancy joining in then visit Jennifer at Crazy for Books here.